A troupe of Police dogs and their handlers stole the limelight during the Hong Kong Kennel Club's Millennium Autumn Dog Show at Happy Valley on November 19. 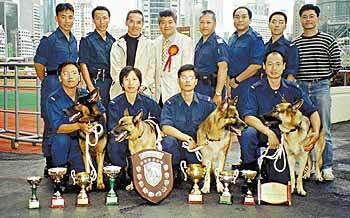 Led by Inspector Penny Chan Man-wing, the four-dog four-handler team demonstrated their talents in a host of obedience trials and were the overall winners of the event. Woman Police Constable Fung Shuk-ha and Artemis came top in the pre-novice section, while PC Hung Ping and KK came third. WPC Fung and Artemis also won the novice category with PC Hung and KK runners-up again. The latter pairing also won the intermediate category while PC Li Ka-fai and Zak came third in the open category.